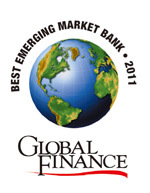 NEW YORK, March 24, 2011 — Global Finance magazine has named the “Best Emerging Market Banks in Central & Eastern Europe” in an exclusive survey to be published in the May 2011 issue. Global Finance editors—with input from industry analysts, corporate executives and banking consultant —selected the best emerging market bank in the region and in 22 countries. Criteria for choosing the winners included growth in assets, profitability, strategic relationships, customer service, competitive pricing, and innovative products.